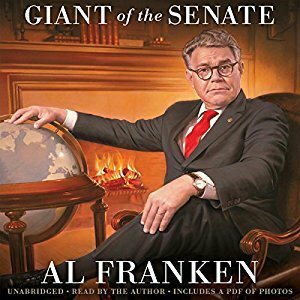 Sign into Goodreads to see if any of your friends have read Al Franken, Giant of the Senate. 60.0% "This has been a great book for our road trip - loving it." Liz wrote: "Minnesota is lovely! until January"
exactly! the winters there are like the summers here- too long and too much!! believe me, most summers I feel like I liked the winters better!! Heather wrote: "Is he making fun of Orrin Hatch? Orrin referred to himself as a "giant in the senate" during his presidential run. Wonder if Al Franken knew that and is being a bit snarky to old Orrin...."
Good question - i dont remember him mentioning OH at all during the book...but i guess it could be an attempt at snark.